As much as America is into midcentury modern and retro interiors, I think that the U.K. is, even more so. Remember all those British cookers — 40″ ranges in all kinds of retro colors and styles? Gorgeous. 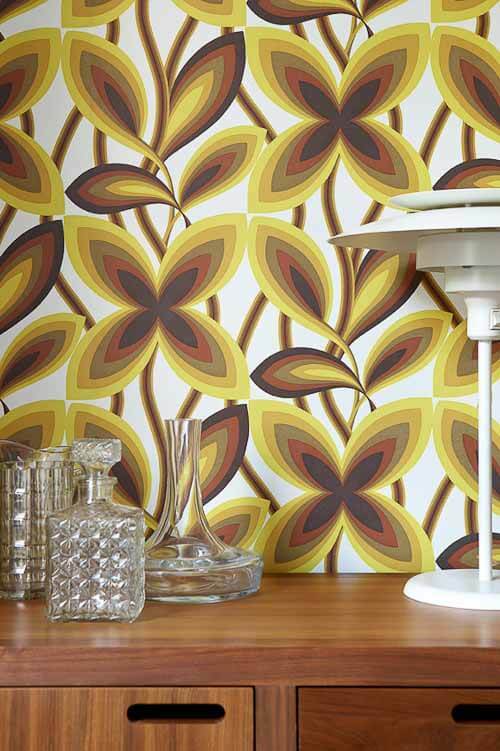 And now, I’ve spotted another range of vintage wallpaper designs — the Retrospectives Collection — recently introduced by the company Little Greene. 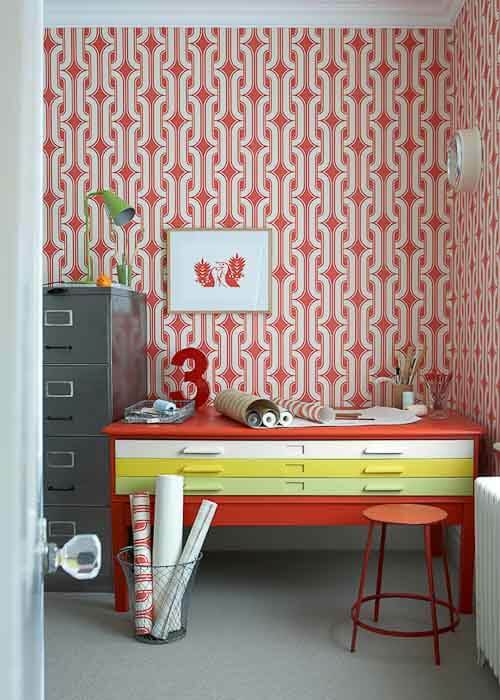 Alas, we cannot get these wallpapers in the U.S. 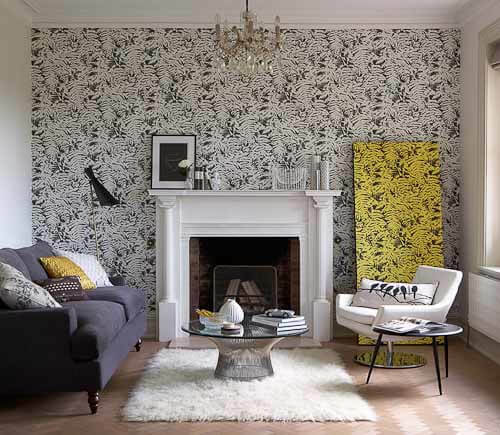 If I were a British interior designer doing rooms for fantastically chic clients, I would be all over these wallpapers. I am a particular fan of the bold, colorful 1960s and 1970s-style graphics, like “Starflower” c. 1967, above. 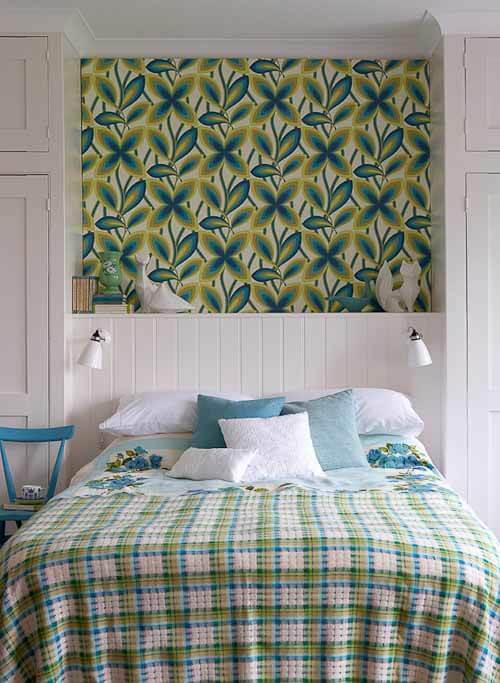 I also adore this bedroom for the lumpy, vintage bedspread … and look at those sheets with big blue roses on them. Sweet. Here is the same paper in shades of gold. No question, it is also very useful to look at the details in these room shots. See how the wood paneling is installed horizontally? A great way to use an inexpensive material in an appealing way. The paper, “Box”, comes from 1962, and was meant to appeal to a very wide swath of buyers. I waaaaant a Warren Platner wire-base coffee table and one of those fluffy white rugs, too. “Fern” (above) comes from 1960 and is available in 7 colorways. Crocheted afghans! A pink and white canned ham trailer! 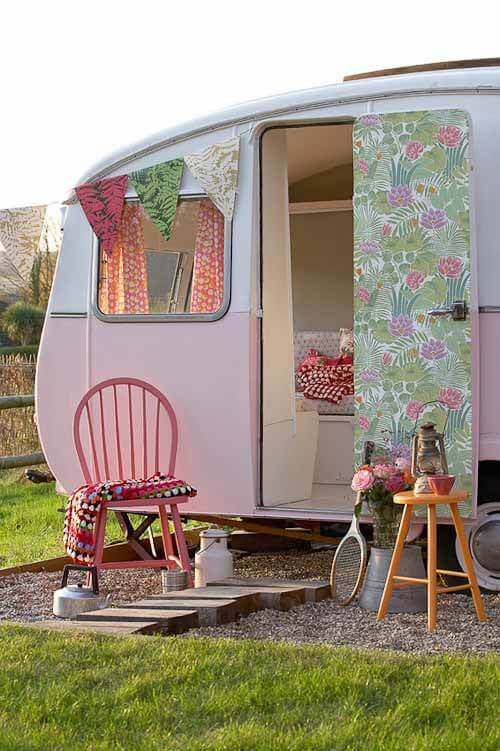 Wallpaper strung as pennants — and circa 1971 “Reverie” wallpaper plastered onto the camper door, too. I’m pretty sure in my recollection that the “shabby chic” design wave that swept across America in the 1990s all derived from fantasy of old Britain to-the-manor-born but all-the-money’s-gone. As in: The chesterfield, even though its upholstery is in shreds, has rich bones, let’s go with the flow and work with it. The “upcycled” aesthetic in America today is an apple pretty close to that the same tree. Now, all this brite wallpaper needs is a nice antique color wash from Ralph Lauren, and it will fit right into the 70s house that, pretty much no matter what you try, will always show the aches and pains of a life well lived. Don’t try to hide it, go with the flow and work with it. Yes: We are always re-interpreting. Part of the “there is nothing new under the sun” — EXCEPT, I will theorize, when a technology breakthrough makes something truly new possible. 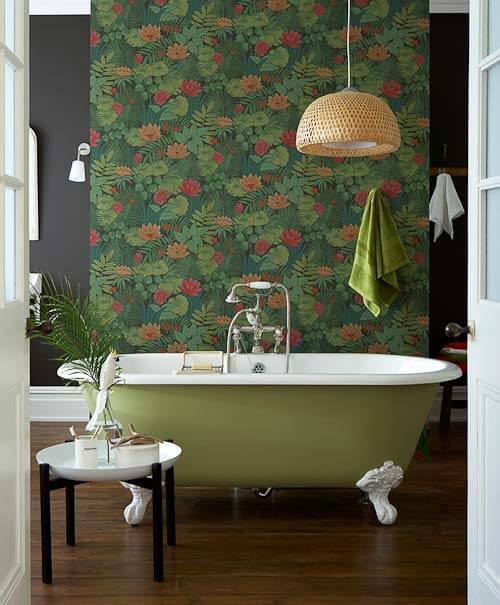 Oh, and LOVE that Little Greene put this with an avocado bathtub. Mitchell and Webb would surely hoot at this one. 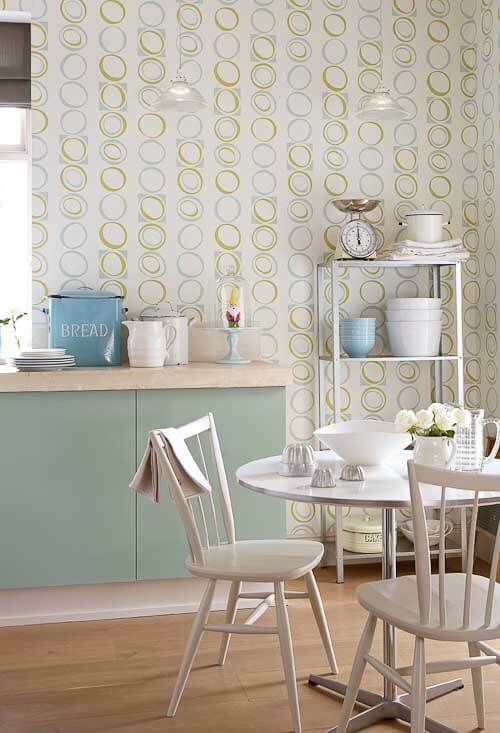 Little Greene fesses up to “toning down” the 1973 “Hepworth” so it works with more interiors today. You know how I feel about “toning down” the 1960s and 1970s: Bah humbug. 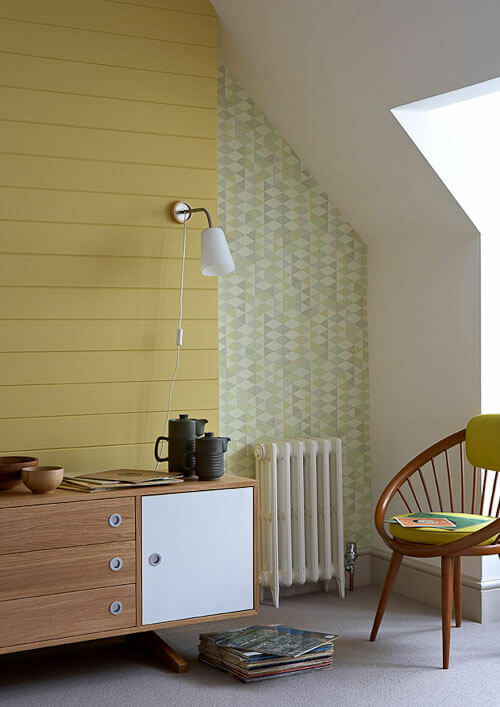 I want to go live in London and design fabulous David Hicks-esque wallpapered houses using Little Greene wallpaper — the ones bursting with unapologetic color, that is. We’re in the middle of ‘updating’ our circa 1963 bathroom. We’re retaining all the original American Standard greenish-teal fixtures. We had to remove some circa 1999 wallpaper from REAL plaster walls…thankfully only one layer. However, might I suggest using warm water with vinegar in a pump sprayer for helping with the removal…and start at the BOTTOM after wetting thoroughly. You will still have to re-wet and scrape a second time to remove ALL the wallpaper glue before a light sanding and priming. NOTE: this is for a FULL/REAL plaster wall, not the new fangled drywall. We were pleasantly surprised to find the ORIGINAL heavy vinyl wallpaper behind the original mirror/medicine cabinet. It literally fell off the wall when we removed the mirror, as the glue was dried out…I’m sure the many steam producing showers over the years helped the process along. It was the only section of the wall we didn’t have to scrape glue off. And, yes, we’ve saved the piece and have plans for it. We plan on posting the before and after photos when all is complete. Thanks for your comments, Monique. I do want to pop in, though, and remind readers: Be sure to test for vintage nastiness such as lead paint before sanding layers; consult with a properly licensed professional. Indeed, indeed Pam! Forgot to mention that we made sure the walls were ‘raw’ plaster even before we started peeling the paper…we did a teeny area…noticed NO base coat, primer, etc. We had also read that older wallpaper glue sometimes contained pesticide(s), so we wore breather masks and gloves for ALL the wallpaper removal and subsequent sanding and wiping of the walls…also kept the kittys out of the entire work zone until every horizontal & vertical surface was clean after the removal! (Our bathroom has never been cleaner.) Can’t ever be too careful when dealing with old and ‘near’ old material removal. Here’s a photo of the wallpaper as mentioned in the previous post. Guess photos can’t be posted in the comments section…sorry. I saw the chronicle show and loved the flamingo bathroom wallpaper is that available ? I love me some wallpaper — here are some favorite stories about both vintage and new wallpaper resources.